Every year, like clockwork, longstanding Oklahoma legislators in the state's house and senate introduce bills that try to find a way around the prohibition on teaching Biblical Creationism in American public schools. These bills have been subjected to evolutionary pressure over the years, cross-breeding, mutating and speciating as their tactics are predated upon by courts and fellow legislators, and as such, watching each fresh crop of bills emerge is a bit like discovering a few more Galapagos finches and working out the unique environmental pressures that gave rise to them. For five years in a row, State Senator Josh Brecheen has introduced Creatonism education bills, declaring that he wanted "every publically funded Oklahoma school to teach the debate of creation vs. evolution." The latest one, SB1322, climbs down from any explicit mention of Creationism, limiting itself to immunizing teachers who discuss the "strengths and weaknesses" of scientific theories. Meanwhile, Republican rep Sally Kern's HB3045, characterizes many branches of science -- biology, chemistry, meteorology, bioethics, and physics -- as "controversial" and allows science educators to teach any "facts" about these disciplines that they believe to be true, without regard to any kind of scientific consensus about objective reality. 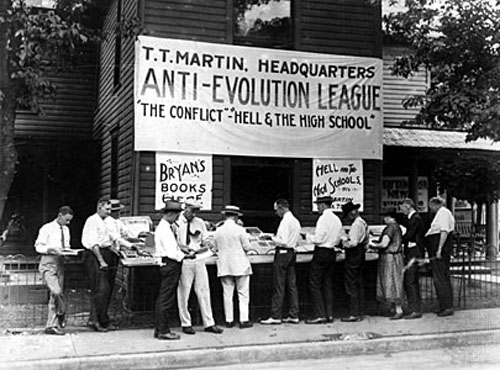 Although the three predecessors of this bill explicitly mentioned religion of their motivating factor, this version of the bill explicitly declaims any religious intent, and insists that it has no common ancestors with those exinct species that failed to pass evolution's tests. The Legislature further finds that the teaching of some scientific concepts including but not limited to premises in the areas of biology, chemistry, meteorology, bioethics, and physics can cause controversy, and that some teachers may be unsure of the expectations concerning how they should present information on some subjects such as, but not limited to, biological evolution, the chemical origins of life, global warming, and human cloning. The bill responds to that uncertainty by ensuring educators can just teach whatever they want as long as they think it's science, and nobody can discipline them. Students, meanwhile, cannot be penalized if they "subscribe to a particular position on scientific theories." And the author makes sure to point out that none of this has anything to do with religion, just in case a casual reader ended up confused by its similarity to earlier bills with overtly religious motivations.